So I was considering changing my OEM 15 inch 195/65/15 wheels with somewhat more fancy 17 inch wheels. Though, after reading about the right size wheels, I'm a big confused... Hope someone here might help make this clear, perhaps for future upgraders as well.. So I know that when upgrading the wheel offset is advisable to keep the same, since the bearing load might otherwise be impacted etc. The problem is though, that when upgrading from 15 inch to 17 inch, Hyundai suddenly advises a different offset value??? (As found elsewhere on this forum). This makes no sense to me... I would think it would be better to keep the center line of the wheel the same. Is this done just because the 17 inch wheel which is wider would otherwise not fit? In the meantime I did come across a nice set of 17" wheels, 7.5J with ET40. This isn't too bad considering the original ET 46, but it sounds much worse considering the advised ET 56 for 17"7J wheels... They'd probably still fit, but I'm not too sure about the handling or any rubbing going on. Is there anyone who fitted similar offset and size who can share experience? I'd have to guess that the wider the wheel, the less depth there is to accommodate it before you hit the strut / spring / caliper running gear behind it, whereas you tend to have more room on the outside, hence the offset. Offset is governed by inside clearance of suspension and clearance of guards of any model. If you can't try on before you buy, forget it. The only other option is to experiment with some plastic or cardboard cut to match the new dimension. Of course the actual size of NEW rubber must be factored in as well when looking at total width. Don't forget to turn the wheels from side to side and check front and rear clearance of each front wheel. Here’s a useful offset calculator Wheel Offset Calculator | 1010Tires.com Discount Online Tire and Wheel Store which helps explain in detail, whether the sizes you’re looking at will fit would still come down to talking with your tyre specialist and test fitting as fore mentioned. Thanks for the suggestions all.. I did indeed calculate the offset difference, but it matters quite a bit if you take the original wheel with ET46 or the wider 7J model with ET56. That's exactly why I can't really figure out the Hyundai logic behind it. That was exactly my reasoning as well, but then it doesnt make sense at all that the ET of the 17" 7J wheel should be ET 56, whereas the 15" 5.5J one is only 46. Using the offset calculator that's actually a LOT less clearance on the inside, whereas the ET40 wheels would leave a lot more room. I guess it's all a balance then basically, but quite hard to figure out the right offset this way! I remember that on my '83 Commodore (Opel Senator) the maximum allowable offset was 25mm regardless of width. I guess if it fits and there's no scrubbing and the steering isn't affected you're most of the way there. In those days, you could only fit rims up to 1" greater width, which meant an increase in track of 1" and I seem to remember most alternative wheels kept the same offset because of it. I must have missed the rule covering offset. Although, the 13" wheels we fitted to our R8s and R10s would never have made the cut today. Standard 15" centres cut down and 5" EH Holden rims welded on, reversed so the tyres had to be fitted and removed from the inside. Awesome increase in track and stability and guard filling appearance..
With thanks to Wilson Wheel Works at Mayne in Brisbane. Yeah. The tyres were "supposed" to be "inside" the line of the guard, looking down from above, when in the straight ahead position. Lots ignored the rule. Or used the old "good yank" on the guard with two hands method. Then guard re-rolling became the thing. My HT 14x8", 4" offset front and rear. Front 235/60's were out past the guards and hit front and back of wheel arches , rear 245/60's past insde lip and flush with external lip. Bump steer galore. The 1" offset is why I mentioned 25mm. I had 235/60s on 14x7s and they were beautifully flush with the guards. The aquaplaning in wet weather was spectacular! Awesome, how was the driver ? That's the look, now imagine standard width tyres hanging out that far on a Dunnydore. Nice torana, imagine if you still had it! 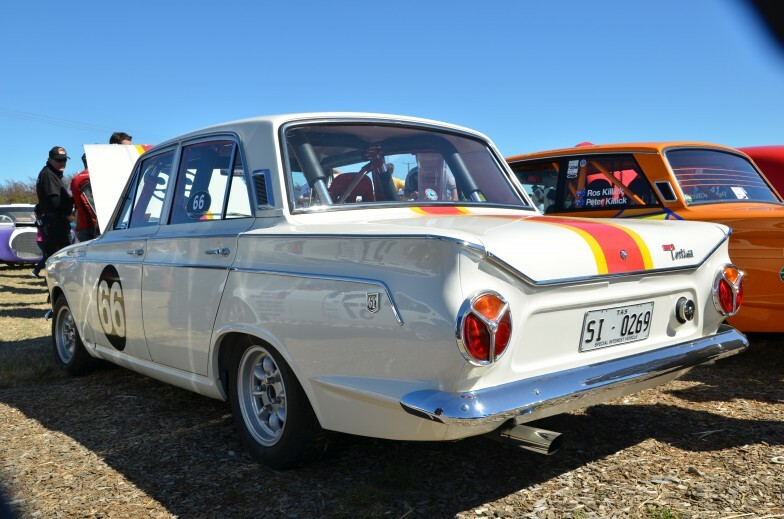 Saw a beautiful Cortina GT MK1 heading out to NZ HQ on the weekend too, roll cage an all. 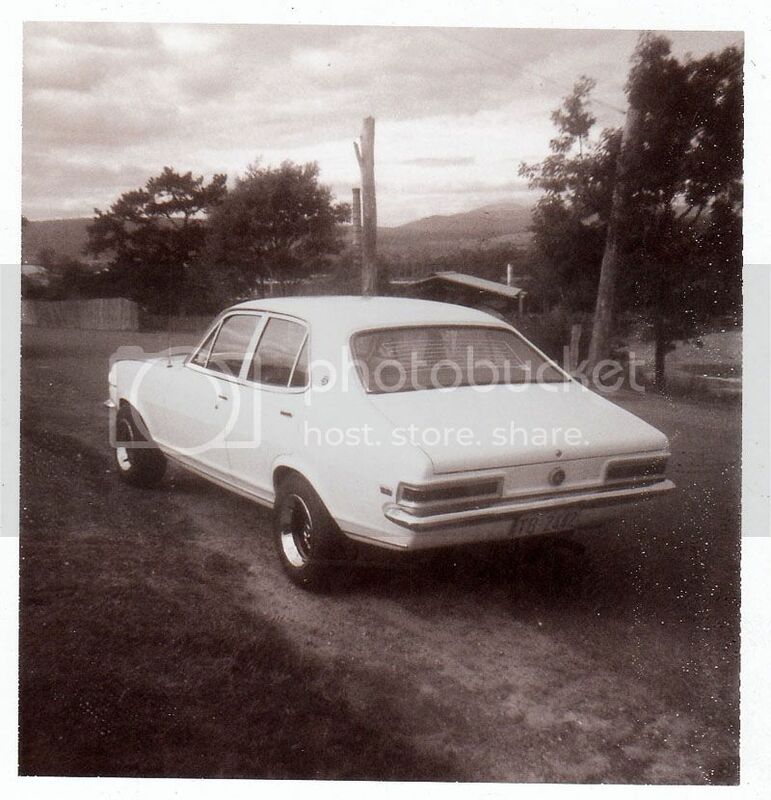 Nice (that's a Tassie one ) My 1st car was a 1968 Cortina 440.